You can now replace that long string of random numbers in your Google+ profile URL with your name, as Google started rolling out so-called vanity URLs to qualifying accounts Oct. 30. It took me about one minute to claim a vanity URL for both my personal profile and the ITBusiness.ca Page. So now you can visit us on Google+ at the easily recognizable http://plus.google.com/+ItbusinessCa/ address. But you can’t just pick any custom URL you want (I was hoping for “+Batman” on my personal profile, alas). Instead, Google has preselected several custom URLs you can choose from. If you’re like me and have a name that’s quite common, you can type a few extra letters onto the end of your name to distinguish it (I went with +BrianJacksonPlus as that’s easy to remember). Nabbing custom or vanity URLs for your social media pages is important for a couple of reasons. First of all, it’s much easier to tell someone to find you there or to type out the URL when you’re writing a message. Secondly, you’ll actually get better SEO results by having a real name in your URL instead of just a number – so if people search for your name, your profile is more likely to come up higher in the results. Of course there’s also the branding reinforcement of having your name in every URL that you own on the web too. That’s it. Pretty simple to hit that mark, especially if you’ve been using the social network that launched back in 2010 and is being viewed as more important to SEO results by many. You’ll know if you hit the qualifying criteria simply by visiting your profile page. (Not the “Posts” section, but your actual profile). At the top there will be a notification asking you to claim a custom URL. Next, you simply choose your URL from the options before you and agree to the terms of service. The terms are actually pretty interesting to check out in this case. 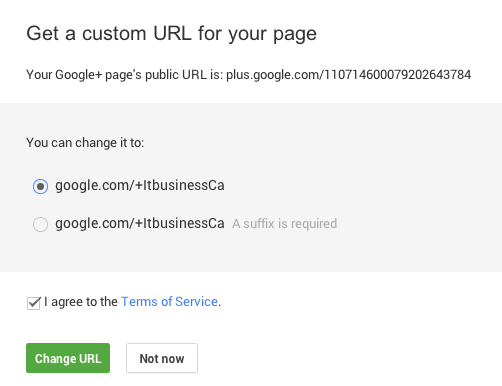 Google warns that it has the option to reclaim custom URLs or “remove them for any reason, and without notice.” It also says that “custom URLs are free for now, but we may start charging a fee for them.” But it says it would issue a notice if it begins charging and the option to stop participating (instead of being forced to pay).